`Great Little Radio Player` is an Internet radio player for Linux that comes with a collection of about 400 radio stations organized by genre and you can easily add more, import or export radio stations. options to play stations on startup and hide window on startup. 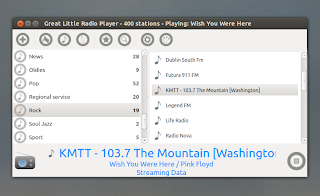 Download `Great Little Radio Player` - there are deb (Ubuntu, Debian and derivatives), rpm (Fedora, Mandriva, openSuse, etc.) and source files available for download.